Aru Sompre (center), an indigenous member and star of his Gavião Kyikatejê team, is part of the changing face of the beautiful game in Brazil. underneath a canopy of tangled trees from which a garish symphony of whooping and whistling plays endlessly, the chief of an Amazonian tribe stands holding a shotgun. He hunts at night because he can hear the boars and the armadillos and the jaguars, and, he says, they can’t see him. For one hour the chief stands still in nothingness, listening for rustling or breathing as the jungle sings to him from every direction. He is determined. He is patient. Zeca Gavião is waiting for the right moment. Twenty million people live in Brazil’s Amazon. Of those, only a few hundred thousand are indigenous. Which isn’t to say that they all still live in huts and rub sticks to spark fires today. But it’s true that, only a half-century ago, many tribes lived primitively because it was the only way they knew. 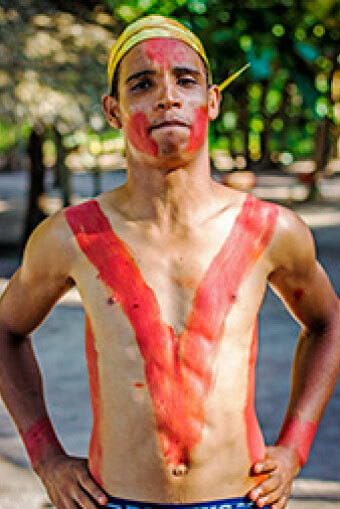 In the 1960s a group of white Brazilians discovered arrows on a beach in the state of Para and tracked them to their tribe—that tribe was home to Zeca, then a boy. The arrival of those white Brazilians and ensuing culture shock led to an exchange of knowledge, a tuberculosis outbreak, the death of Zeca’s father, and then relocation. It also brought soccer to the natives. Pretty much every boy born in Zeca’s tribe since its “discovery” has grown up playing soccer, just like the rest of the boys in Brazil. Some of the tribal boys were particularly good at the sport, and over the years they formed amateur teams to compete in the state league. 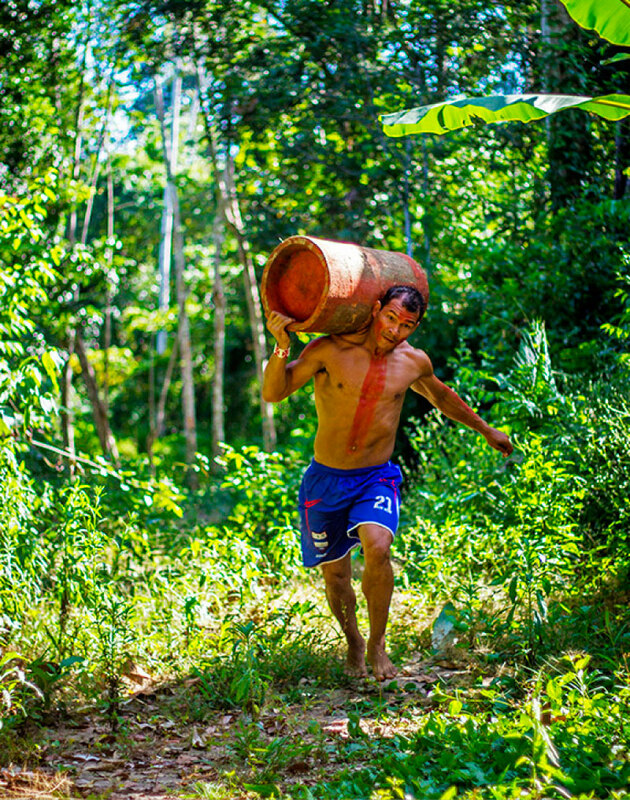 As Zeca grew up and became his tribe’s chief, he encouraged all his tribesmen (and women) to learn and love the sport. Zeca Gavião, who as a boy went through the culture clash of indigenous and white Brazilains in the Amazon before becoming a tribal chief, has encouraged his people to embrace the game of soccer. But sometimes it doesn’t matter how good a player is. Aru Sompre, the best footballer to be born in the tribe, was coveted by at least one coach in São Paulo, the largest metropolis in Brazil and a powerhouse soccer city with a professional four-way rivalry. When Aru tried out for a regional team, one coach told him not to identify himself as indigenous on his application. If he did, he was told, the club’s president wouldn’t accept him. The members of Zeca’s tribe, Gavião Kyikatejê (pronounced Gah-vay-oh Kee-kah-teh-jay), weren’t surprised to hear this. For decades they’ve heard a refrain of slurs from non-indigenous Brazilians, including at amateur soccer matches. Go back to the forest! Go play with your arrows! Yes, the tribe lives in a forest. And yes, they know how to shoot arrows—they even fire them at their soccer players during training. But, perhaps in defiance of those jeers, Gavião (which means “hawk”) has embraced what makes it a unique tribe in the world. Pretty much every boy born in zeca’s tribe since its discovery has grown up playing soccer, just like the rest of the boys in brazil.some of them were particularly good at the sport. Zeca’s village, known by the same name as the soccer team, Gavião Kyikatejê, is located in a clearing deep in the forest, on a reservation set up by the Brazilian government. It’s population is listed at 178 people. In 2009, Zeca entered his tribe’s amateur soccer team into Brazil’s professional strata, making it the only indigenous squad in all of the country to compete professionally. He served as the club’s first coach, and he has always been their president. They started in the third division. Last year they advanced to the premier league in Para—an accomplishment that drew attention not just from other tribes but from the urban areas of mainstream Brazil that have long overlooked the country’s natives. “There are referees who would not want Indian people playing here,” Zeca says. 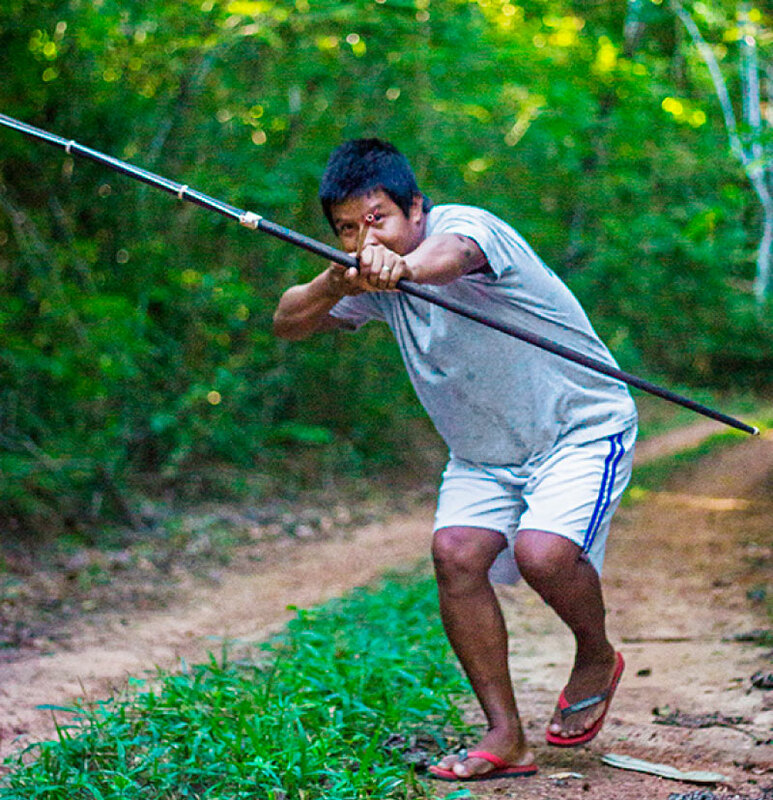 When the best archer in Gavião Kyikatejê slings arrows at players, that’s to improve their agility and speed. When teammates stand in a river for hours on end, beginning at 3 a.m., staying perfectly still (because if they move they’d be bitten by eels), that’s to improve their concentration. And when tribeswomen paint the players with smashed red berries before the men sprint through the forest carrying 100-pound logs in a relay race—that’s to improve a lot of things. That race—“running the log”—was the main sport for the tribe’s ancestors. Setting up the race alone takes an entire afternoon. It starts with a handful of men walking through the forest to find a straight tree with no humps in the trunk. They find a good candidate, and then one of them hacks at the bark, at thigh level, with a straight long knife. Then he does the same on the opposite side. “Let’s move; it’s going to fall,” says the sharpshooting archer who accompanies them to defend against wild animals. Making a point: An expedition into the forest to chop down a tree requires the company of an archer for protection against wild animals (above)—just as Gavião’s soccer training also involves barrages of arrows sent flying to improve players’ quickness. The tree’s demise begins with a rustle, its leaves slowly falling against other branches, until it’s caught in the arms of the trees behind it. Out comes the knife again. More hacking—quickly this time—until the tribesman splits the trunk and it slams to the earth. The surrounding trees reverberate as if in applause and newly liberated leaves float down like confetti. On the ground, the trunk is chopped into yard-long portions, the bark and insides erupting. Next the men smooth the edges with the knife. They hollow out the ends roughly six inches so they can be gripped, and they smear the same red berries, urucum, all over the bark. The logs are left in the forest, with large green leaves draped over them for decoration. tribeswomen paint the players with smashed red berries before the men sprint through the forest carrying 100-pound logs in a relay race. “Running the log” was the main sport for the tribe’s anscestors. After selecting a suitably tall and straight tree, the men of the tribe fell it with a long knife. On the forest floor the trunk is chopped into yard-long segments and smoothed. Then the ends of each segment are hollowed out to provide a grip and the logs are painted with the same red from the mashed berries. The following morning the players dash into the woods to retrieve the logs, hoisting them onto their legs, then lifting them to their shoulder blades; they run back, rolling the log onto their teammates’ shoulders in the relay. The entire course is just a half-mile and takes about four minutes, but by the end they’re all panting, their sweat dripping over the red paint on their skin. To celebrate the return of the log they stand in a circle chanting with an old man who sings in the indigenous language and blows a one-note wooden flute; and they devour a meal that has been cooking for 12 hours while buried in dirt—shredded root melted onto the meat of a boar that Zeca shot the day before. They eat with their hands. For the training/bonding exercise of running of the log, the Gavião Kyikatejê players trade their soccer jerseys for a more traditional—and inspirational—kit. Not your usual baton: Just lifting the log is an arduous task, but running relay style the players transport it over a half-mile course through the forest in about four minutes. 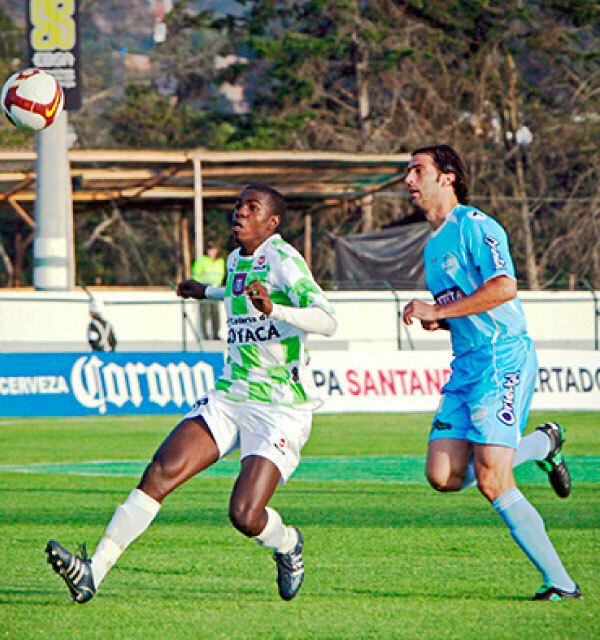 Gaviao Kyikatejê began its maiden professional season, in 2009, with only indigenous players. The members soon realized they needed help, and the next year the team brought in professional players who weren’t natives. They offered to pay for a new way of life for the newcomers using the money that mining companies paid the tribe every month for the rights to move minerals through the forest. Gavião adopted the non-natives and taught them their customs. They called those new players kupay. Zeca treats the kupay like he treats his own people, but he wants his professional team to have more indigenous players than not—his goal is 80 percent. To do that, the tribe started an under-20 team this year with 19 indigenous players and 10 non-natives. At the end of their season, those boys compete in the playoffs in Belem, the capital of Para—a 90-minute flight for most people, but for them a wild 12-hour bus ride across the barely-maintained roads of the Amazon. For one month they live away from home, like reverse city slickers, in a house owned by the tribe for natives to use when they visit the city. Forty people live in the minimalist one-level structure with only a handful of bedrooms. Most of the boys sleep on mattress pads in the courtyard or in tents; only a half-dozen of them get bunk-beds, all in one room. They all miss their families. But on this night, before a morning match that could end their playoff run and send them home in defeat, there’s another game they must watch: the opener of the World Cup. They cram into a small room populated by just a refrigerator, several dozen chairs and a 32-inch Toshiba. Before kickoff they watch as three children on TV walk onto the field in São Paulo, where they release doves; one of them is wearing an indigenous headdress. Before the opener of the World Cup in Sao Paulo, with the eyes of the world upon them, three young Brazilians walked onto the field to release doves in a gesture of peace and hope. That one of the three was wearing an indigenous headdress signaled the country’s need to embrace a new sense of inclusiveness in its national game. Haprã Jõkare Komaytere is anxious. He doesn’t want to watch the hour-long pregame pageant with the others. He’s the top scorer on the under-20 squad, and he’s more disciplined. It’s remarkable how many natives consider themselves Brazilian even though they are treated like aliens. When the Brazilian national team plays, Haprã cries out in support as much as any teenager from Natal or Rio. But he wishes he could do so without also supporting everything Brazilian that the team stands for. “I want to separate the team from the government,” he says. Haprã walks in, clapping. The minutes are ticking away: Brazil is about to host a World Cup game for the first time in 64 years. Someone drops a sprawling bowl of popcorn on the table behind them and the kids rush from their seats, cram the popped kernels into their mouths, and get back to their places just in time for the start. Fireworks are popping outside in the street. The screen is tainted with static, and the image rattles in the frame. Croatia scores on a bizarre own-goal in the 11th minute and the kids’ screams sound like a crowd rebelling in only treble, with the bass cut out. To the members of the Gavião under-20 squad, watching on the eve of a match of their own, Brazil’s World Cup opener provided a roller-coaster ride of emotions. Croatia’s jumping out to a 1-0 lead on this own goal was a particularly scary dip. At halftime, with the game tied, everyone leaves for the courtyard, where they check their Facebook and WhatsApp updates or juggle soccer balls. Haprã isn’t coming back. He’s too anxious and upset with what’s unfolding. Haprã has lived this scenario before: In the first big game he ever played, his team was losing; but he scored two goals and carried them to a win. It’s a game that will likely stay in his head for his entire life. Whatever he summoned on that day, though, he can’t find the strength to watch his idols lose the opener. But inside the TV room the others are cheering Brazil’s star forward, Neymar, who brings his team back from the brink with his second goal of the game. “I am Brazilian since I was born!” screams one crazed kid. In the end, Brazil wins—just as everyone in the country knew they would—and in towns for miles around the party is electric. Immediately after the final whistle, revelers move into the streets to set off fireworks; they honk horns in declaration of their allegiance. One kupay on the team, Walex Rafael, calls his girlfriend, who lives in a bigger city, and holds the phone up so that his teammates can hear the riot in their small house in Belem. Brazil’s eventual triumph in that opening game against Croatia set off a celebration among the Gavião players that mirrored the ones throughout the country (above). Alas, disappointment would follow for the youngsters from the Amazon, just as it would -- in devastating fashion, in the semifinal against Germany -- for the national team. Before bed, the coach—Zeca’s 27-year-old son, Jakurere—calls a meeting. He shows the team a video of the professional Gavião squad, which fell to the bottom of the rankings this year and was demoted after one season in the premier league. In the video, the telegenic star Aru pledges to overcome discrimination. “We have to fight against prejudice,” Jakurere says. Playing the drums, we are passionate again. We are the blood who defends the flag within the Amazon. We are going to go, go, go! Even their opponents acknowledge that Gavião play with a special kind of heart, that they play for something more than just a score. They’ve all seen videos of the players carrying those logs through the forest. Before stepping onto the field, the team prays in a circle—draping their arms around each other and muttering to God—and listens to one final pep talk from Jakurere. Band of brothers: Showing their colors, the Gavião under-20 players were joined by pro team members Aru Sompre (fourth from left) and goalkeeper Wrias Silva Santos (third from right). Fuming, Jakurere smokes a cigarette. He knows his team is dampened. The players clap. Then they lose. But not before Babu scores on a penalty kick. On the field, the defeated Gavião team huddles one last time. They’re on their knees, arms over each other’s shoulders, praying again. Before the whites made contact, when Zeca was a very young boy, he was out collecting Brazil nuts with the men of the tribe, including his older brother, a priest who was believed to dabble in a sort of magic. As they approached one tree they were confronted by a jaguar, a sacred animal that is said to have taught man how to make fire. Zeca protested but was overruled. He never saw what happened next, but soon after, when their father died from the tuberculosis brought by the whites, Zeca’s brother told him the end of the story. “The jaguar told me that something very bad was going to happen,” his brother said. Years later, when the tribe relocated to a government-zoned reservation, their new chief ordered that all of their dogs be killed. He believed they would bring misfortune to the people. Zeca was put in charge of handling the corpses. Months later, Zeca was meeting with indigenous leaders in another city when he got a call from home. His brother had fallen ill after touching the blood of an animal he’d hunted, and he’d died. 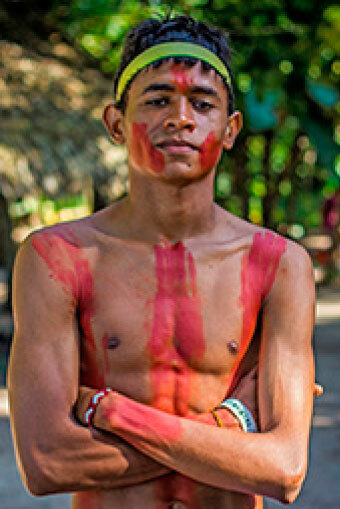 Zeca moved his family from the tribe and started a new one, Gavião Kyikatejê, making himself the new chief. Zeca has invited Ever Palacios, a Colombian who played in the 1998 World Cup, to the village in hopes that he might want to coach the under-20 team. For Palacios, that would mean moving not just to another country, but to a tribal environment. The tribespeople of Gavião have simple houses and cars, but their way of life is unmistakably rustic. “I’m a warrior, so it’s no problem,” Palacios says at sunset outside Zeca’s house. Improvement for Gavião’s players will require increased exposure to the game beyond the Amazon. To that end, Zeca invited former Colombian World Cup player Ever Palacios (left) to work with the under-20 team, a challenge Palacios—a self-described “warrior”—welcomed. 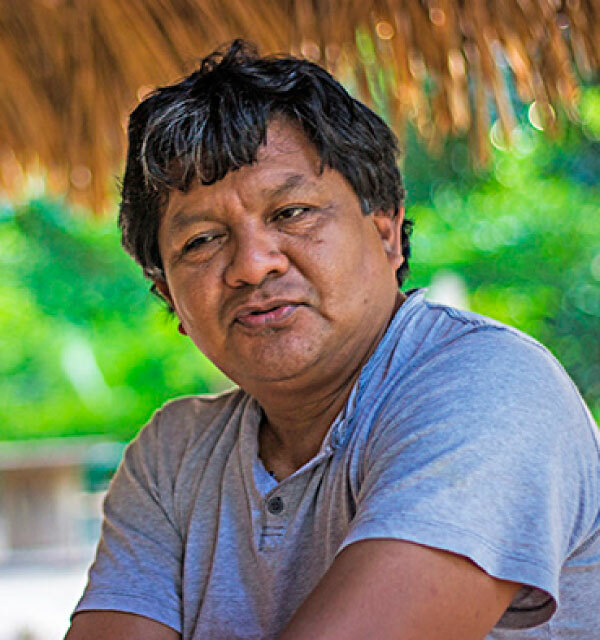 “It’s impossible to protect the forest because man is destroying it,” Zeca says, and he explains how the tribe has accepted some trappings of modern life. “Don’t you think that this new world will destroy your culture?” Palacios asks. Up on a hill, a horn starts blaring, at first in bursts and then in one long note as if the driver has fallen asleep on the steering wheel. This is the U-20 team arriving from Belem, their 12-hour bus ride finally over. The boys have opened the windows and are screaming, their high-pitched yells echoing far past the houses. The bus stops in front of Zeca’s house and he greets them, hugging each boy as he steps down to his native soil. They’ve all changed into their green training jerseys. It’s a joyful homecoming, even if they’re all exhausted from the sleepless ride, deflated from their loss. They’ve spent a half day without soccer, and now a few of them plant themselves in front of a TV surrounded by massive trophies that the amateur Gavião team has won; here they watch England play Italy in another World Cup match. The game on TV is being played in Manaus, the enormous commercial hub of the Amazon that sits nearly 400 miles west of Para. This is a sore subject. When the Brazil Football Confederation selected Manaus as a host city, many people in Para felt snubbed. Para is known as the most soccer-loving state in the country. One rivalry in Belem, between Paysandu and Remo, is regarded as one of the most aggressive in Brazil. 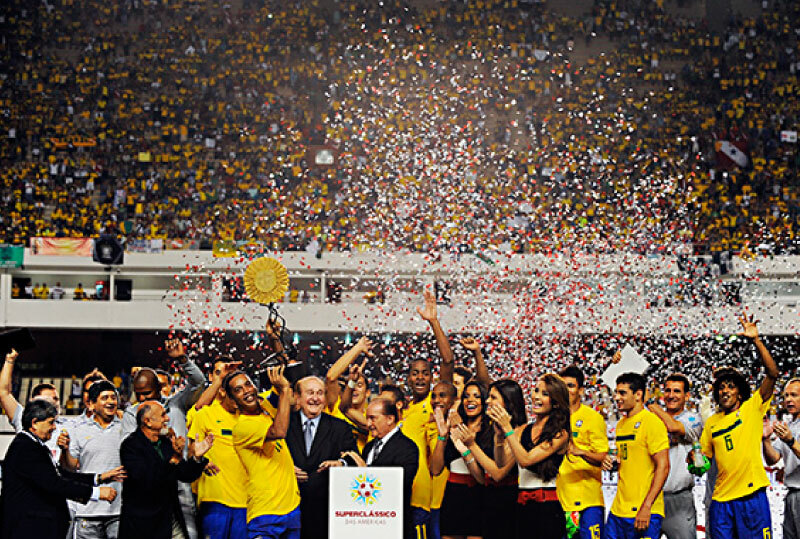 And when the national team played a derby against Argentina in Belem in 2011, the 45,000-seat stadium was packed. The feeling in town was probably as close to a World Cup match as possible. The crowd of 45,000 that turned out in Belem to see Brazil defeat Argentina in 2011 offered joyous testimony to the region’s embrace of the game. Yet, much to the locals’ dismay, the city was passed up when it came time to choose sites for the 2014 World Cup. Surely the planning committee would reward Para’s love of the game, they had thought. The city has organized leagues for little people and people without limbs. 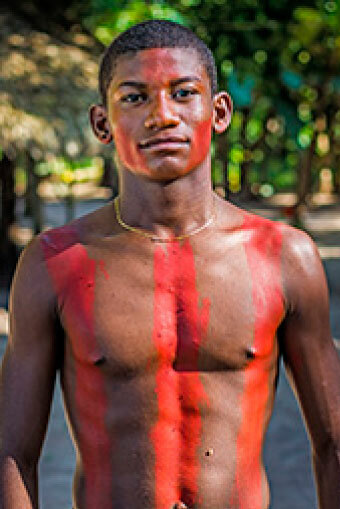 The Gavião tribe had even begun preparing for the World Cup by collecting animal bones and making traditional ornaments and decorations, hoping they would get to share their culture with the world under the game’s biggest spotlight. But instead they chose Manaus, a metropolis that barely reflects Amazonian culture. A brand new stadium ended up costing $300 million—and because Manaus has no major soccer team, it’s unclear what that arena will be used for after the World Cup ends. The people of Belem scoff at the notion that soccer fans, tourists and journalists who flew to Manaus for World Cup games in Arena Amazonia—of which there were only four—will return home with stories about the time they stayed in the jungle. One of these people is Beth Cheirosinha, a local celebrity who sells indigenous concoctions to cure things that doctor’s cannot, such as struggles in love and luck. Another one of her products is a special shower gel that, if used properly, is said to bring success to Brazil’s national soccer team. On the night the Gavião boys return, Zeca drives to a nearby tribe, home to four Gavião players, including Babu. This other tribe is throwing their players a surprise party, but this tribe is much less modern. Instead of houses, they live in huts made from dried wood and leaves. Tied to a pole in the church—which is just a pavilion—are red, white and black balloons, the colors of Gavião’s uniform. 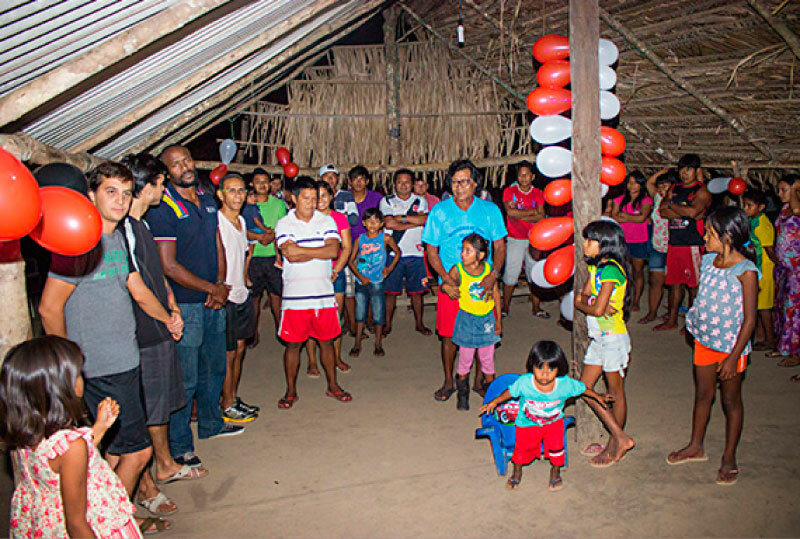 A church of a neighboring tribe provided a colorful, if more primitive, setting for a surprise party for Gavião’s under-20 team. Zeca speaks to his four players in front of the tribe. “We have to show that it is possible that everybody who dreams can get what they want,” he says. Zeca doesn’t shoot anything on that impossibly dark night in the jungle. But he walks plenty. Perhaps he thinks of the jaguar he once killed in a hunting challenge. Or maybe he thinks about his brother, who saved him from the jaguar by speaking to it. But probably Zeca is just listening for the sounds animals make when they try to sneak through the vines and leaves, looking for twigs pushed aside enough to suggest that something had moved it that way. He pauses again, his breathing perfectly silent. He’s ready to shoot, but there’s nothing there. Zeca turns around and heads home. Of the three doves that those children on the field in São Paulo released into the stadium air just before the World Cup opener, two of the birds crashed into the stands. One of the children was of indigenous descent, and immediately afterward he unfurled a banner demanding land rights for natives. But the cameras cut away to avoid controversy, and nobody watching on TV saw it. The dove that came from his hands—and fluttered eagerly above everyone, free to live on its own—is that the one that survived? On the field, the struggles and the emotions shared by Aru Sompre (center) and his Gavião teammates, indigenous and not, are the same as those experienced by soccer players around the world. They ask only that their acceptance be the same as well.